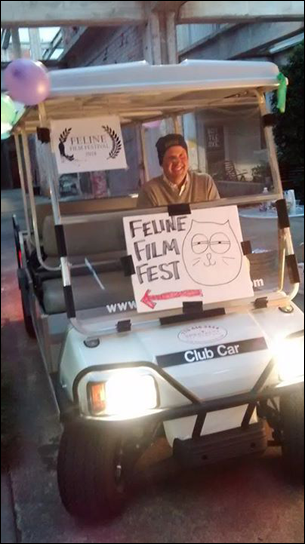 Thanks to all supported the 2014 Feline Film Festival. View photos from the 2014 event! View photos from the 2014 event! 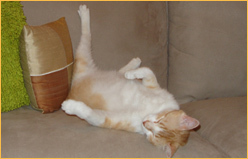 The second annual Feline Film Festival was held on November 1, 2014 in Atlanta, Ga. Through ticket sales and generous donations, the event raised over $3,500 for LifeLine Animal Project. So, in just two years we've raised over $5,500 for the kitties! The following films were shown at the 2014 Feline Film Festival in Atlanta, GA. The order they are listed in is the order they were presented in the program. Samantha Martin and her extraordinary cat circus. Bob and Charlie get together with the girls for a memorable Thanksgiving dinner. Corduroy Cat asks Stanley for food. Corduroy Cat sneaks a slice of pizza into the bathroom. Furry models in the most fetching custom-made cat wigs ever created. A short about the difficulties of independent filmmaking - and cats! When Mike found Schrödinger's on the side of the road, he never expected they'd be besties. The true story of the world's fanciest cat. Corduroy Cat is a Swiftee. Cory's cats seem to be broken so he calls the help desk. Jane loves her cat, but she can't find Mr Right. Corduroy Cat sings his love for his cardboard box. 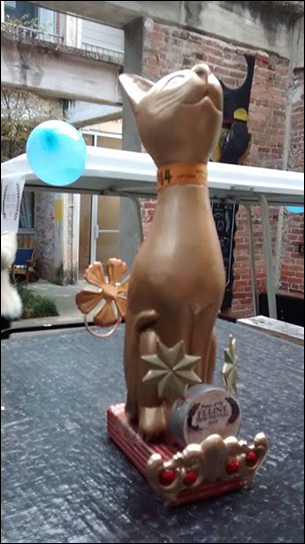 * The Corduroy Cat videos are the winner of the 2014 Pawe d'Or winner for excellence in feline filmmaking! See more Corduroy Cat on his Vine channel: https://vine.co/CorduroyCat and follow Corduroy Cat on Facebook. A cat’s effort to gain the attention of his gadget-obsessed human companion. Never call a cat stupid. A ferociaous battle between a Tonkinese cat and a Pug dog. A black cat explores the bizarre landscape of the last drive-in theater in Atlanta. An experimental video starring a purring tabby. Corduroy Cat and Stanley chirp out over a bug. 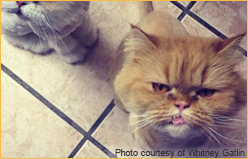 Psychic, medium, and animal-healer, Saige Winters, offers her insight on the emotional wellbeing of two high profile felines - Grumpy Cat and Keyboard Cat. A dramatic story about a cat cowboy. Grandma Carolyn McReynolds shows off her bengal kitten Itaki's love for water. A kitty music video of the "Men Na Mah Na" song. Don't be that guy with breath that makes a kitten cry. Corduroy Cat gives Stanley some tough love. UGA researchers attach cameras to kitties to expose their secret lives. Yana needs to work, Fedor the cat needs love. 2 screenings and 4 hours of kitty fun condensed to 23 seconds. Video courtesy of Labtopia Farms. Atlanta, GA. The framing shows the front part of the screening room, the inside concession stand, and the venue's Art-O-Mat. 2014 Ticket sales benefit LifeLine Animal Project. 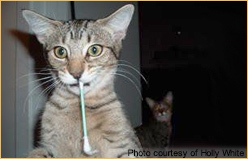 Cat allergies? No worries! This festival is scientifically-proven to be hypoallergenic. All are invited to attend. 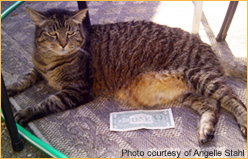 Sponsor the 2015 event and be a furriend of the festival. See the sponsorship opportunities. Can't get enough of the kitties? Neither can we. See more cats!